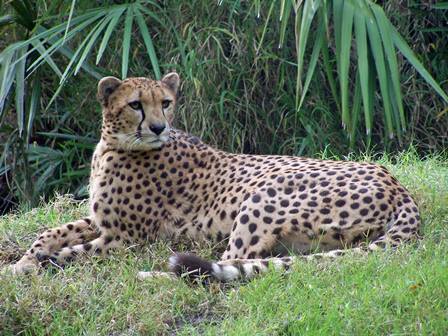 Last week, Brevard Zoo staff euthanized its four-and-a- half year old female Cheetah, Basil, due to her failing health. Basil came to Brevard Zoo in February of 2010 from White Oak Conservation Center in Yulee, Florida. She was transferred to Brevard Zoo per an Association of Zoos and Aquariums Species Survival Program (SSP) recommendation with her sister, Pepper, and an unrelated older female. The three cheetahs arrived for the opening of the Zoo’s Expedition Africa cheetah exhibit located next to the rhinoceros yard. Zoo keepers noticed a change in Basil’s behavior last week and a follow-up surgical exam discovered that the female cheetah was suffering from pancreatitis. After she did not respond to medication, and exploratory surgery revealed a severely damaged pancreas, the decision was made to humanely euthanize her. Following the loss of Basil, zoo keepers are keeping a watchful eye on her sister, Pepper, since they have never been separated. Zoo staff said that Pepper’s behavior is more subdued, but she is eating her normal diet. In addition to Pepper, the Zoo also has Peggy on exhibit in Expedition Africa. Peggy and Pepper are rotated between the exhibit and the back yard. On June 18, 2011, the Brevard Zoo euthanized Sasha, a 15-year old cheetah. Since 2003 and the opening of Expedition Africa, the Brevard Zoo has contributed more than $14,000 to a variety of in-situ cheetah conservation projects. According to the Cheetah Conservation Fund, about 10,000 to 12,500 cheetahs are estimated to remain in 24 to 26 African countries plus less than 100 animals in Iran. With about 3,000 animals, Namibia has the world’s largest number of free-ranging cheetah. Cheetahs have been kept in captivity for over 5,000 years. The captive population suffers from a lack of genetic diversity, making them more susceptible to disease and decreasing reproduction.